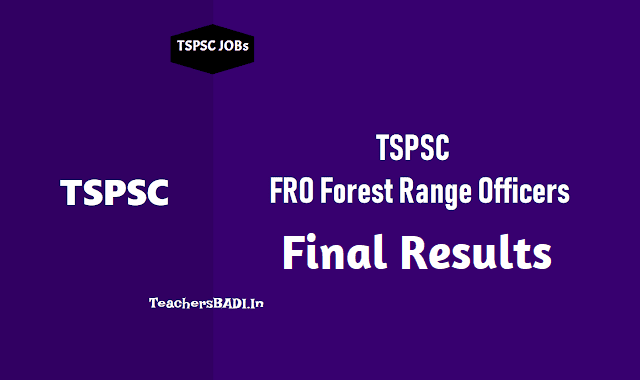 TSPSC FRO Forest Range Officers Marks list Results, Final Selection list Results 2018: TSPSC FRO Forest Range Officers 2nd spell Results announced, TSPSC FRO Forest Range Officers Medical, Physical test, Events dates /schedule to be announced soon on its website. List of Canidates for TSPSC FRO Forest Range Officers Medical, Physical test, Events: The result Notification Dt; 27/04/2018 on the basis of written examination held on 11/11/2017 & 12/11/2017 to the post of F.R.O. in Forest Department, the candidates called for second spell with the following Hall ticket numbers and have been provisionally admitted to Medical, Physical test and Events. The candidates who successfully qualify in Medical, Physical Test and events will be called for Verification of Certificates. On the basis of Oral Test(Interview) held on 05/10/2018 and 06/10/2018 at TSPSC Office, Nampally, Hyderabad, Certain candidates are provisionally selected for the post of Forest Range Officer in Forest Department vide Notification No.46/2017. And the list is hosted on the website. For list of candidates and further details candidates can visit Commission’s website www.tspsc.gov.in. The results of the written examination held on 11-11-2017 & 12/11/2017 FN & AN, Physical and Walking Test, Medical Examination, Certificate Verification and Oral test (Interview) held on Dt: 05-10-2018 & 06-10-2018 at TSPSC Office, Hyderabad, to the post of FOREST RANG OFFICER IN FOREST Department, the following Hall ticket numbers have been provisionally selected for appointment to the post of FOREST RANGE OFFICER IN FOREST DEPARTMENT vide Commission’s Notification No.46/2017, Dt: 15-08-2017. The selections are published here with subject to the following conditions. On the basis of Written Examination held on 11/11/2017 and 12/11/2017 FN & AN, Physical & Walking Test, Medical Examination and Verification of Certificates to the post of Forest Range Officer in Forest Department vide Notification No. 46/2017, certain candidates have been provisionally admitted for the Oral test (interview) for the post of Forest Range Officer which is scheduled to be held on 05/10/2018 and 06/10/2018 from 09:30A.M onwards at TSPSC Office, Prathiba Bhavan, M.J. Road, Nampally, Hyderabad. For list of candidates and further details candidates can visit Commission’s website www.tspsc.gov.in . 1. It is hereby notified that on the basis of Written Examination held on 11-11-2017 and 12-11-2017 FN & AN, Physical & Walking Test, Medical Examination and Verification of Certificates to the post of Forest Range Officer in Forest Department the candidates with the following Register Numbers have been provisionally admitted for the Oral test (interview). 2. The candidates who have qualified for Oral Test (Interview) are required to attend at TSPSC Office along with hall ticket, Original Certificates and two (2) Passport size photos on the relevant date and time as mentioned in the following schedule. 3. If, on further Verification, it is found that any candidate is not eligible with reference to the particulars furnished by him/her in the Application Form / Checklist / Certificates, the results of such candidates shall be cancelled at any stage of selection process. TSPSC FRO Forest Range Officers List of Candidates for Oral Test(Interview) 2018 and Oral Test(Interview) 2018 Schedule. The candidates may note that they were provisionally admitted for written examination with condition that their candidature will be rejected at the time of verification, if qualification is not equivalent to the prescribed subjects as per notification. The candidate who are admitted for the verification of certificates are required to produce the Original Certificates along with one set of Photostat copies duly attested by Gazetted Officer, relating to Age, Qualifications community (Integrated), Latest Creamy Layer Exemption certificate in case of B.Cs as per Memo No.3009/BCW/OP/2009, Government of Telangana, Backward Classes Welfare (OP) Department, Dr: 18/12/2015 (Prescribed format hosted on Commission’s website), Certificates relating to claim of age relaxation, Study (from 4th class to 10th class), basic information data (Check List(1set)), attestation forms(2sets) and if any, at the time of verification of documents, failing which, they will not be admitted in subsequent process of selection. No request will be entertained for subsequent submission of any of the above certificates. In terms of the notification, the candidates should possess the requisite qualifications as on date of notification i.e 15/08/2017. The dates for verification of Certificates will be announced later. Meanwhile the candidates are requested to obtain and keep ready all the certificates as mentioned in the Notification. If, on further Verification it is found that any candidate is not eligible with reference to the particulars furnished by him/her in the Application Form/ Check List/ Certificates, the results of such candidate/ candidates shall be cancelled at any stage of selection process. The Physical Test and Events will be held on 13/08/2018 .